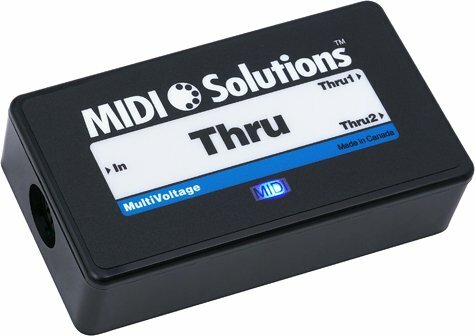 The MIDI Solutions MultiVoltage Thru is a 1-in 2-out MIDI Thru Box. All MIDI messages appearing at the MIDI input are passed to both MIDI Thru outputs. Active circuitry cleans up any skewing of MIDI data bits that has occurred at the input, ensuring reliable operation in setups that require daisy chaining or long cable runs. The Thru box is MIDI-powered, and requires no batteries or power supply to operate with most MIDI products (for more information read the Power FAQs). A MIDI indicator LED lights up when the product is powered and flashes when MIDI data passes through it. MIDI Solutions MultiVoltage products are compatible with both the original 5V and new 3.3V MIDI specifications, for more information read the MultiVoltage FAQ. If you have any questions about this product by MIDI Solutions, contact us by completing and submitting the form below. If you are looking for a specif part number, please include it with your message.